The plant stand is made entirely out of iron. it is suitable for indoor use, in the living room, hallway or conservatory, for example. the flower rack looks especially charming against a wall. 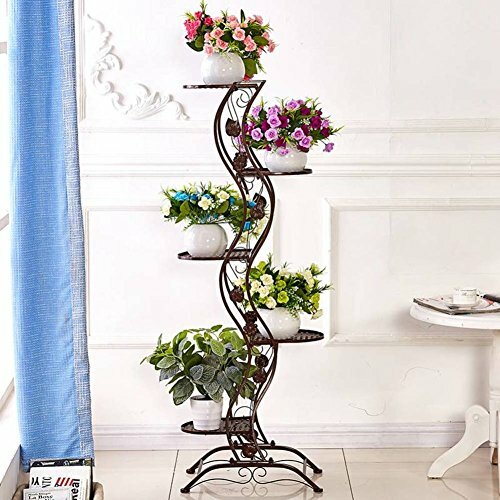 These lovely flower stairs provide endless space for you to display your favourite plants. present your colourful buds, herbs, flower pots and vases with a personalised plant corner. Plane flowerpot bracket design,flower pot can be placed most of the types of the hollow out pattern design,covenient drainage and beautiful,generous.pallet storage coordination and not compact. shipping time: 10-15working days/Please contact us if there is any question. Warmth Tips: 1.Quick and easy assembly 2.When assemble, it doesn't need to be locked tightly, after assemble, then it needs lock tightly. If you have any questions about this product by Flower racks, contact us by completing and submitting the form below. If you are looking for a specif part number, please include it with your message.